30 Novembre 2017 | in English. 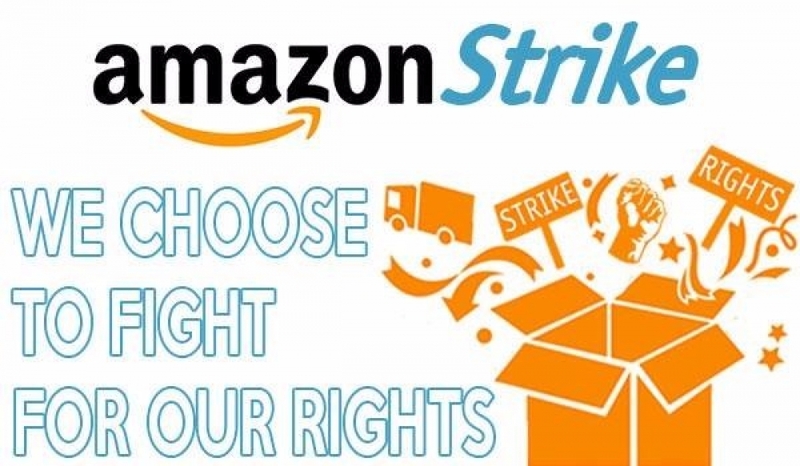 An account and some musings on the "Red Friday", the strike of Amazon workers in Italy and Germany. For an insight on Amazon (its organization, its main Italian plant and its forms of labour we address you to our inquiry: “Amazon: Quando la merce danza automatizzata sul lavoro-tapis roulant”). ving global chain erasing the time of circulation of the goods - by jumping immediately from production to consumption (and then to the immediate realization of profit) - finds in a company like Amazon an emblematic and basically monopolistic model. Amazon’s logistic fancy is the one of an incessantly moving automated system, leading the products just in time and to the point. Yet, this picture of a smooth and spotless world develops thanks to a repressed factor, the one of labour. It is not by any chance that, in front of the strike led in the day of consumerist triumph of Black Friday, the only statement by the American company was: “Our customers will experience no delay”. Those disruptions accounted for by the managers never take labour into consideration. Labour does not exist, if not as a simple mechanism (with an annoying tendency to wear down). Only the last years’ strikes shed light on how bodies and minds of men and women in flesh and blood keep the apparatus functioning. The problem Amazon is now facing is that, by increasing its grip on the market, it was forced to resort to an organizational tool opposed to the goal in respect to which logistics emerged during the so-called post-war “logistical revolution” (actually a counter-revolution that anticipates and lays the basis for the subsequent neoliberal restoration. Indeed, logistics was used in order to dismantle workers’ concentrations, the workers’ power that structured itself in the Fordist factory. Mixing up the production chain on the territory, organizing production and distribution on an international scale indeed eroded the antagonist power of the big factory. However, Amazon today is forced to resort once again to “concentration”. In order to manage the enormous flow of goods it cannot exclusively resort to small warehouses, subcontracts and fragmentation but it is forced to build warehouses/factories of circulation, organized like assembly lines. Therefore, if in the latest decades logistics represented the industrialization of a since then “non-industrial” sector like the “mercantile” one of handling of goods, here we go with a first crack at one summit of its with this Strike Friday. That is, when the fancy of a work being reduced to a mere conveyor belt breaks itself on dignity of labour and insubordination the worst “logistical nightmares” appear. Last Friday some thousands of Amazon workers between Italy and Germany practiced an early form of struggle. Whereas in the latter it is a matter of a long-standing dispute led by the Ver.Di union and supported by an organized social platform under the “Make Amazon Pay” slogan, in Italy it was the first event of this kind. The mobilization was called in the first place by confederate trade unionism*, that cunningly tried with this move to take the lead on an emerging tendency, the one of the processes of refusal within the incoming era of the “new metropolitan logistics”, that is, of the logics of the delivery of goods in any urban place through digital platforms. However, the territory of Piacenza where the Amazon warehouse stands has been crossed for years by a process of workers’ organization in logistics that decided to take the floor by delivering a simple concept: to strike means to block. While actually the confederates will probably bet on a negotiating table in order to soften some of the most hellish features being implemented in the Amazon plant (like the cameras monitoring the restrooms’ corridors), the demonstration promoted by the SI Cobas union in Piacenza immediately pointed towards the strengthening of a much wider struggle perspective. It is not by any chance that four antiriot police units, upon an explicit request by the confederates, prevented the hundreds of workers organized within the SI Cobas from approaching the entrance of the Amazon plant. And it is not by any chance, too, that - at the same time - a picket at the SDA courier in Modena - witnessed the serious episode of two warehouse workers being run over by a truck. SDA, as many other companies, features a number of orders as an Amazon contractor. The day of Friday, with a great media exposure, then had both interesting and contradicting features. A pivotal game is being actually played on the boundary of organization of labour that Amazon (and all the others logistics and delivery companies) is introducing. The accomplished industrialization of circulation of goods is now at a crossroads between normalization and absorption, or towards new possible scenarios of conflict able to bind in a single thread labour concentration points and its metropolitan spreading. On these edges, the day in Piacenza, the wedge introduced by the SI Cobas workers in the confederate mobilization, is a first feature of a process to be developed.